Risking exposure for all that he's done, Malcolm Daniels wants only to redeem himself with the pack and win back Celia's trust. But as demon forces invade, Celia's magic--and her own conflicted feelings for Malcolm--will be tested in ways neither of them ever would have imagined. I do love reading a good paranormal romance. Heck I enjoy reading almost any paranormal romance. There is just something about the 'others' living and loving among us that sets my imagination afire. So needless to say, I enjoyed LYING WITH WOLVES. The main characters, Celia and Malcolm, have their issues, some rather large ones, that they need to overcome before they will be able to rebuild a real relationship. And I enjoyed watching them face and try to overcome those issues. I found however that it was a couple of secondary characters that really stole the book. Ruby and Jade are Celia's cousins and totally unfamiliar with their bloodlines since their mother died when they were young. Being worried about Celia, they follow her when she heads back to the Colony. I found them to be spunky and totally loyal to each other and Celia. I really hoping that they merit their own book. 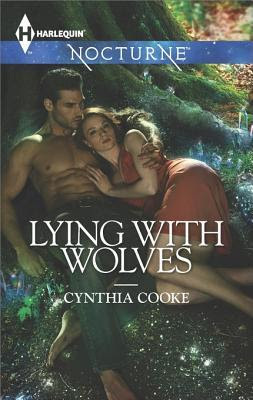 LYING WITH WOLVES is an easy to read book but other then the twins, I didn't really find anything that stood out from the other in this genre. Fun to read if you like paranormal romance but not one I would recommend that you rush out and buy.